Cycle for a cause at Bodies by Burgoon’s Torque Cycling! ONE HUNDRED PERCENT Your $20 registration fee will be donated to the Minnesota Military Family Foundation in honor of the upcoming Veterans’ Day. As long as you show up to ride, you earn another ride for use in the future...so really...you're raising money and getting a great workout FOR FREE! About the Minnesota Military Family Foundation: The mission of the Minnesota Military Family Foundation is to provide timely financial assistance to deployed and currently serving Minnesota military personnel and their families – which includes active duty, national guard and reserve components, across all services – who have a financial crisis that is not supported by existing state or federal programs. The Minnesota Military Family Foundation is a 100% volunteer organization. Join Brianna Bernard for the fun! Class is at 10am on Saturday, October 27th! Cycle for a cause at Bodies by Burgoon’s Torque Cycling! ONE HUNDRED PERCENT Your $20 registration fee will be donated to Hope Chest for Breast Cancer for Breast Cancer Awareness Month. Bonus? As long as you show up to ride, you earn another ride for use in the future...so really...you're raising money and getting a great workout FOR FREE! About Hope Chest for Breast Cancer: Getting cancer is scary. And expensive. Hope Chest fills an urgent, unmet need: Alleviating some of the financial burdens associated with breast cancer treatment. While patients focus on the fight of their lives, we focus on helping patients stay in their homes, keep the heat and lights on, and put nutritious food in the fridge. We help make sure that patients can get access to transportation and child care so they can attend treatments. Did you know that several of our clients have fought the fight while they've trained with us. Some we still see each week, and some live on in our hearts. But, every time you see a random pink workout item on our training floor -- know it is not random at all. We purchase something in honor of each of our clients who fight. And we're PROUD AND HONORED to fight beside them. Join Missy Bruggeman for the fun! Class is at 10am on Saturday, October 13th! Pizza! Putting a healthier spin on one of our favorite dinners! You don't need to hold Blue Cross Blue Shield insurance to attend. The event is free and open to the public. 100 Percent of every $20 registration fee is donated to MADD. Longtime Bodies By Burgoon and Torque Cycling client Janessa Sturtz leads the volunteer committee for MADD after getting hit head-on by a drunk driver in a crash on 35W four years ago. Thank goodness she is still here to share her story and change lives. Read her story of strength here. Join us at Solhelm Properties' newest location -- Borealis in Minneapolis' North Loop for fitness/mobility tips, nutrition insight, and some delicious breakfast bites from Wandering Kitchen and some beverages! **This event is open to residents of: Solhavn, Soltva, and Borealis apartments. An estimated 47 million people worldwide are living with Alzheimer’s disease, including more than 5 million in the United States. The Longest Day fuels the efforts of the Alzheimer’s Association to provide care and support to all those affected while advancing critical research toward methods of treatment, prevention and ultimately, a cure. From in-person support to online education programs and promising worldwide research initiatives, the funds raised will make a difference in the lives of people affected by Alzheimer’s today and those who will face the disease tomorrow. 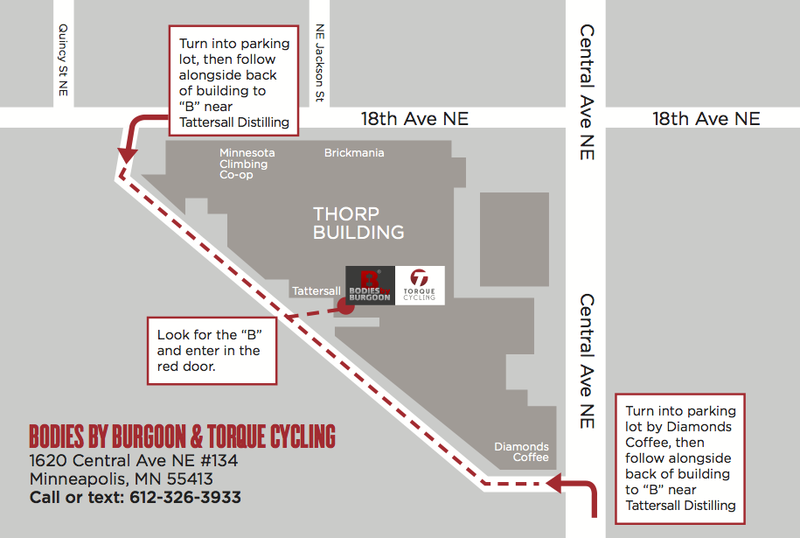 Join Bodies by Burgoon & Torque Cycling at the NEW The North Face Edina location in The Galleria (suite #3477)! This Women's Special Collection store is NOW OPEN! We will have in-store cycling class demos, 1:1 personal training session & cycling package giveaways, free gift bags, healthy snacks and MORE! Join us this year at a series of JLM FITraisers! What is it? Well, it’s a series of FITness inspired fundRAISERS for you to attend from August through May with your fellow JLMers and friends! Each event will cost just $25 and give you the opportunity to try out different fitness regimens all over the Twin Cities metro area. Feel free to bring your family and/or friends to join in the fun. Pedaling Kindness is Torque Cycling's regular fundraiser for area non-profit organizations. A 60-minute indoor cycling ride with BRIANNA (for this special event) gets you a workout and a full heart (because all of the money goes to charity)! Dawn, a woman who loves cooking and dining out, had to revisit and overhaul her eating habits when she transformed her life with exercise and a 140-pound dramatic weight loss. She had to embrace a new style of cooking and, most importantly PREPARATION so she could set herself up for success. Attendees will leave this session with ideas for weekly meal prep and a strategy to help them make healthy choices when eating out…including recipes! In the end, the attendees will have an outline for fueling their body nutritiously (and realistically) every day! A healthy heart is for everyone. Keep it strong -- it keeps you alive. Join Dawn Bryant, a passionate healthy living enthusiast, and a panel of guests who will share their stories of surviving delicate medical procedures on their hearts, and potentially life threatening tragedy. You’ll be inspired by their stories of survival and strength. No matter your age, you’ll leave with tips — from activity to nutrition — to help keep your heart healthy!